What we know is that Williams was aware that Oswald was in custody and under suspicion. He was at the police station because Fritz had asked Stenkel to collect all those who had been on that floor during the morning and obtain statements from them. Arce, Lovelady, Dougherty and Shelley were also at the police station when Oswald was brought in. He was also aware that the 6th floor was important. Also, he and Jarman and Norman claimed they heard shots above them.Williams did not know that his lunch was a factor at the time he made the first statement. He likely heard of its importance during the evening and next day. Also at this time the police knew from Rowland that there was someone wandering around the sixth floor with a rifle about 12.15 or so. His unfinished lunch was originally found in the SN (but moved shortly after the discovery of the shells) and he left the 6th floor about 5 minutes before the shots rang out. 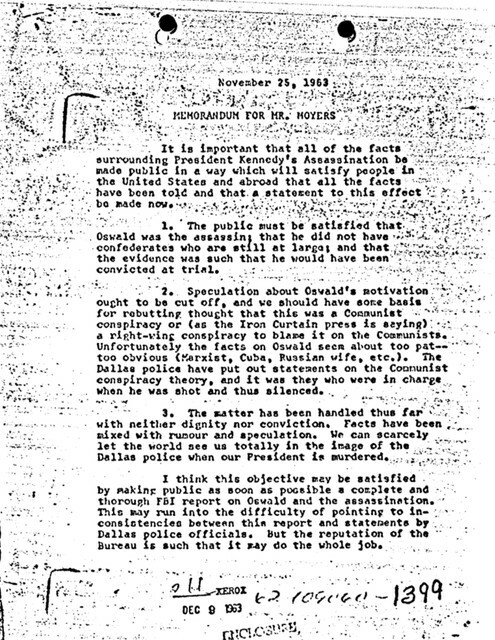 Just a few hours after the President was shot, Williams says nothing of his presence on the sixth floor after the "elevator race". He also says nothing about seeing Oswald just prior to the shooting. we know that Williams was aware that Oswald was in custody and under suspicion. If BRW had known that Lee was going to be accused of firing a rifle from the sixth floor, Would BRW have said..." Hey, I was eating my lunch on the sixth floor and I never saw Lee Oswald there while I was there". Personally, I believe Williams could have honestly made that statement while he was at the police station.... But at that time nobody was saying that Lee Harrrrrrvey Ossssswald the arch villain had fired that old military rifle from Bonnie Ray Williams lunch table. The brief that analysis lawyers Ball, Belin etc were essentially working from. "We are supposed to be closing doors not opening them." J Lee Rankin. The Warren Report. A timely sedative that served a purpose for us all. The Commission was made up of 14 Assistant Counsel and 12 named staff members plus additional personnel were hired to perform specialized functions, such as for the writing of the report. Of the 14 Assistant Counsel selected to conduct the overwhelming majority of witness interrogation and selection of witnesses 12 came directly from private practice, one a law professor and one, Willens, was the only associate member who worked for the federal government prior to being selected. It was these guys who collected and analyzed the reports submitted by various agencies of the federal, state and local government for the purpose of determining the value and truthfulness of witnesses. When expert witnesses were called the associate members in whose area the testimony fell had the responsibility to become very familiar with the subject. Whenever you see an FBI report of any type of investigation dated after the initial FBI investigation report was submitted it was thanks to the associate members insistence that such investigations were conducted. These guys weren't forced to take pay cuts, time away from their family, perform long hours of exhausting work in cramped quarters just to rubber stamp what is presented by many as just a forgone conclusion. They had doubts, their own agendas, their own theories and they certainly didn't have any obligations to the commission or the federal government that would require them to be in a position that their jobs and careers were on the line unless orders were strictly followed. They were there to perform their duty as they saw fit and were free to leave and not be held accountable, as some did. He either saw the shot or he didn't. Which is it? By the way, Brennan also claimed in his book that he saw JFK's head explode. That's some fast reflexes there. P.S. How do you know that Brennan "identified both Jarman and Norman when they came down from the fifth floor"? Did he specify who was who and what window each were at? What about Williams? And were those guys crouched behind boxes or hanging out windows? Brennan definitely identified both Jarman and Norman. Read his testimony. Mr. BALL. Did you stay there? Mr. NORMAN. Well, we stayed there I believe until we got the news that the motorcade was coming down, let's see, is that Commerce, no Main, because Commerce- we went back in the building, James Jarman and I. He doesn’t say how or from whom he got the news. Maybe it was second hand. But there was a transmission from car 1, that they were approaching Main about 12.22pm. Why would Norman make that up? How do you know that wasn’t the reason Jarman and Norman changed from going with Givens to the parking lot on Record to the 5th floor of the TSBD? The motorcade was running late and maybe someone in the crowd thought the motorcade should be in Main St by now...like 12:15 so that's the possible source for Norman's initial 12:15 PM time. As I have said before I don't believe any of the three Amigos was lying. What did he say on March 18? When did Jarman say they all went up? When did Williams say they all went up in his first day statement? Of course after that his "story" changed. Mr. BALL. When the cement fell on your head, did either one of the men notice it and say anything about it? Mr. WILLIAMS. Yes, sir. I believe Harold was the first one. Mr. BALL. That is Hank Norman? Mr. WILLIAMS. I believe he was the first one. He said "Man, I know it came from there. It even shook the building." He said, "You got something on your head." And then James Jarman said, "Yes, man, don't you brush it out." By that time I just forgot about it. But after I got downstairs I think I brushed it out anyway. Question: Why does cement dust fall on William's head, if it actually did? The real question is about: When Norman says to Williams "you got something on your head" and then Jarman says to Williams "yes man, don't brush it out"
That’s because Williams was not with them at the time. Not so sure about who he identified but the important information was there were only two on the fifth floor. Brennan did not get into position sitting on the wall until the ambulance officers had attended to Belknap.....12.24. Brennan likely saw Williams, wearing khaki, leave the SN to join them and assumed it to be the assassin. 1) According to you BRW was at one point in the SN and that Jarman and Norman were covering for BRW by claiming they all walked together to the fifth floor. 2) This coverup is supposed to have begun soon after all three were taken in for questioning. Mr. GIVENS. When I got down to the first floor Harold Norman, James Jarman and myself, we stood over by the window, and then we said we was going outside and watch the parade, so we walked out and we stood there a while, and then I said, "I believe I will walk up to the parking lot." C) Did BRW join Jarman and Norman after Givens left? If he did where the heck was BRW before he joined Jarman and Norman? D) If BRW saw Oswald in the SN so what? The Dillard photo and the testimony of Jarman and Norman and that of Brennan exonarate BRW from being an accesory to the crime. I mean, why would Jarman and Norman risk themselves for being accesories to the crime by covering up for BRW if they thought he had something to do with the crime. By accesory to the crime I mean that's the only fear that would cause BRW to believe he was in any danger and needed Norman and Jarman to cover for him. It's only logical to me that if BRW had seen Oswald in the SN, even if BRW didn't see the rifle and thought Oswald was just one of the many watching the motorcade, that once he and Junior and Norman heard the shots coming from right above, that BRW would not be so stupid as to not put two and two together and tell his fifth floor buddies that he just saw Oswald were the shots came from. F) Why would Jarman and Norman go along with covering for BRW if it was an innocent encounter? G) Being an accesory to a murder, especially to that of the POTUS, is a pretty serious offense. Do you really believe that David Belin would have gone along with the coverup? Do you really believe that David Belin would not have brought out in the open an attempt at a cover up of any kind?" After you have addressed the above post I'll have a better idea of what all this Three Stooges stage act is all about. That's not it. Belin wanted to find out if Brennan could have had a good view of Oswald on the SN so he challenged Brennan's ability to recognize individuals on the fifth floor windows as being one and the same as the two whom he saw while being questioned by the police. It's an interesting story as told in Belin's book You Are The Jury. When I get a chance I'll post the exchanges as they were transcribed during Brennan's testimony.